Today's beer, OWA, is a bit of a mystery. 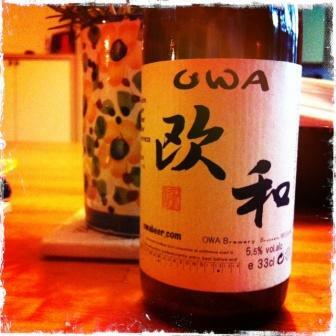 The label says it’s, “brewed in Belgium by Japanese brewer”, but the website offered, owabeer.com, doesn’t reveal much more. Some additional online research unearths a site that has a bit more information, but it’s still not a whole lot to go on. The bottle before me may have been brewed at Brasserie de la Senne. Or perhaps De Ranke. The brewer, it seems, is Leo Imai, who may actually have a recording contract with EMI. Or maybe not. But enough mystery. Let’s move on to the taste. An amber beer, OWA has a thin yet fizzy mouthfeel, and the base is a good mix of sweet and bitter. It has notes of Tootsie Roll, somewhat oddly... 5.5% alcohol. Overall, it’s OK, though not spectacular. Leo Imai, professional chemist and Sake sommelier, has his own brewery in Uccle, where he produces Owa beer, mostly for Japanese restaurants and for export to Japan. You can buy it in the Japanese Nagomi superstore on avenue Vleurgat, along with the sushi (on Saturdays) and soy sauce.